Investment bonds usually have stable or set incomes. Investment bonds are debt instruments that are purchased by investors to offset risk and also to provide diversification to a portfolio. These investments generate reasonably stable income over a period of time. Investment bonds may be issued by a regional or local government, or by a corporation in need of capital. Bonds are considered a relatively safe investment in comparison with equities, although the stock market holds greater promise for surprisingly high returns. Trading in investment bonds takes place in the fixed-income markets. In exchange for a loan, bondholders receive a certificate detailing the value of the bond, the interest rate, the frequency of payments, and the maturity date or expiration of the contract. Investors receive semi-annual interest payments over the term of the bond and receive the principal amount when the bond matures. The combination of a bond's interest and principal payments constitute its yield. Investing in bonds carries less risk than equity investments because bondholders receive priority for payments over stockholders. Another feature of investment bonds includes a characterization of being a safe investment due to the steady stream of income provided to investors over a period of years. Savings bonds, for instance, may be used as vehicles to save for a college education. Taxes on savings bonds may be deferred until the maturity date of the bond. Investment bonds may be issued by a regional government, local municipality, or corporation. In the US, the government issues bonds known as treasuries, because they are issued by the US Treasury Department. Proceeds from treasuries are used, for instance, to pay down the country's national debt. The life of US treasuries varies from three months to 30 years in duration. In addition to government-issued bonds, companies issue debt through investment bonds in the fixed-income markets as a means to raise money. Investment bonds issued by a corporation tend to pay higher interest than government bonds. This is because the risk of a company defaulting on a loan is typically higher than a government failing to make payments, and therefore investors are taking on more risk. A corporate investment bond may be rated by a third party agency. This debt rating is a reflection of how much risk the bond carries and the likelihood that the issuer will default on a loan. Investment-grade bonds carry less risk of default than non-investment grade bonds do. Non-investment grade bonds, also known as high-yield or junk bonds, are issued by companies that are more vulnerable to missing interest or principal payments based on credit history or other debts on a balance sheet. How Do I Choose the Best Investment Assets? What are the Best Tips for Investing in Bonds? 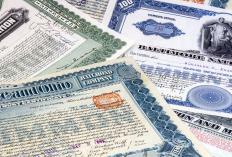 What are Capital Investment Bonds? How do I Choose the Best Investment-Grade Corporate Bonds? What are the Best Tips for Investing in Corporate Bonds?